Yunnan is a province in the foothills of the Himalayas. This area is very remote and difficult to pass. However, here you find the Rain Forest is still beautiful with some very quiet buddha temple also residents are still traditional, Do not forget to see the unique animals like wild elephants still roam. Here you will find a wonderful cultural mix crowd unmolested. You will see a mixture of different cultures from the other china here. Local ethnic as Dai, Hani, Yi and other southeast Asia similar to those mostly because of marriage with Thailand, Lao and Burmese people. Besides you look at cultures and traditions are shown. 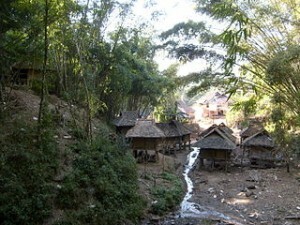 You can also go down to the village of the Dai and saw some monks praying buddha. Once you see the pagodas and villages in Xishuangbanna, now is the time to enjoy the natural beauty of the cool in the Xishuangbanna Tropical Botanical Garden. Here you can walk to explore the 900 acres of tropical forest with 1000 species of animals and plants such as trees, bamboo, pigs, and more. Before you come here you can book transport and accommodation in one package that is usually provided by a local travel agent. One of them is the Anantara Xishuangbanna Resort and Spa which provides a complete facility with 103 rooms, restaurant, private pool, roof and walls here are decorated by lotus motif typical of china. You can also follow the journey provided by Wild China by passing through the city Dai Market and Verdant River Valleys, in addition you can continue the journey through mekong to Northern Thailand.